The easiest way to support Johnson Creek Watershed Council’s commitment to restoring Johnson Creek is to make a direct, tax-deductible contribution today. Your contribution helps make the important work of the JCWC possible, such as implementing restoration projects, providing educational opportunities, and coordinating the efforts of our partners. Click here to donate now! 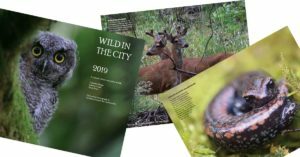 LIMITED TIME: 2019 Wild in the City calendar – featuring photography by Johnson Creek wildlife photographer Caz Zyvatkauskas and printed by the generous support of the City of Gresham. Quantities are limited but if you donate $150 or more during our 2018 winter friends campaign, the first 35 donors will receive one or you can buy one for $15 (pickup at our office), or $17.50 sent in the mail. Become a Friend of Johnson Creek with a tax-deductible donation to JCWC through Network for Good. Network for Good is a nonprofit that helps other nonprofits process credit card gifts. When you click on the Network for Good image above, it will take you to a special page the Watershed Council has on the Network for Good website. Once you create a username and password you can securely donate a gift directly to the Watershed Council on this site using your credit or debit card. Network for Good charges 5% on each transaction (which is the standard rate) but they provide an option for the donor to cover this small fee as well. 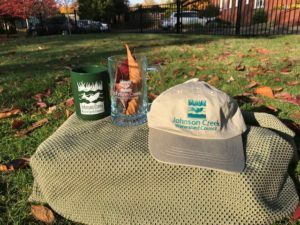 The end of the year is an excellent time to consider a donation to Johnson Creek Watershed Council. While JCWC is always pleased to accept cash gifts, there are a number of options to consider. You might want to consider donating other assets. For example, gifts to charitable organizations can include appreciated stocks or other securities, personal property, or real estate. These types of in-kind gifts make no impact on your cash flow during your lifetime, can relieve you of the burden of managing property, and help reduce your assets and taxes in the future. JCWC can be named as a beneficiary on your life insurance policy or retirement fund. This can have real advantages when it comes to income and estate taxes since retirement funds may pass tax-free to charities. Funding a charitable gift annuity or creating a charitable remainder trust can provide you a fixed, regular income for the rest of your life. There are many ways to give that cost you nothing during your lifetime, reduce your capital gains, save on federal estate tax, and provide JCWC with valuable capital to help us accomplish our mission. If you have questions about how planned giving can benefit you and JCWC, an attorney, CPA or financial advisor can help you make a decision that works best for you. When you sign up for Amazon Smile, a portion of the proceeds from your purchases will benefit the nonprofit of your choice. Go to smile.amazon.com and search for our legal name: Johnson Creek Watershed Association. Ever go to Freddies? By registering online, each time you make a purchase, a percentage of the proceeds will go to the charity of your choice. Choose JCWC and contribute to our mission even while you get groceries. Coffee mugs – 15oz dark green for $6 each. Hats – with adjustable velcro for $15 each and Beer Steins -15oz clear glass are $12 each or two for $20. These are available all year, we prefer pickup at our office, but we can ship for an additional cost.